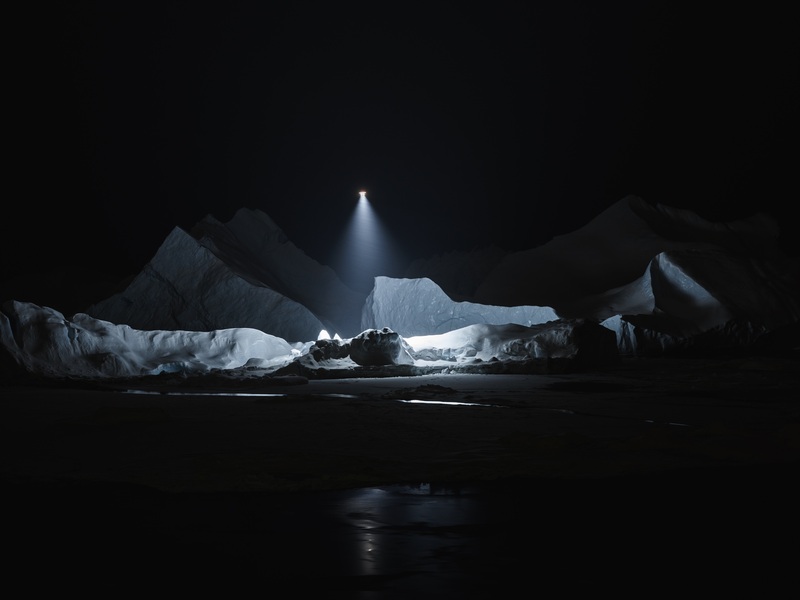 As part of its partnership with Art Basel globally, beauty brand La Prairie unveiled a project in Hong Kong created by artist Julian Charrière, called Light Upon an Imaginary Space, an artistic film showcasing icy landscapes shot around the world, including in the home of La Prairie and Charrière: Switzerland. A short edit of the full film, of which La Prairie was patron, was shown at the brand’s booth at Art Basel in Hong Kong last month, and precedes the final cut, which unveils breathtaking scenes and seeks to question and highlight the changing perceptions of these terrains, from the once seemingly unknowable wild to now a resource that needs our protection. We spoke to Charrière about the motivation behind his piece, and his experiences collaborating with La Prairie. It’s very difficult to describe your own artistic practice, but it’s a lot about exploration, it’s a lot about trying to find out the meaning of some places, and how you actually apply meaning to a place. About the fact that nothing is neutral. I’m very interested in the fact that let’s say if you look at a mountain in the back of Hong Kong, you will see through the eyes of the hundreds of thousands of people who have looked at it before. It’s about how culture influences vision, and I like to work in very culturally loaded, energised spaces. This is a good example — the Arctic and Antarctic are relatively new discoveries. From the moment that the first person was there, till today, the vision that we have and the understanding we have of these places is completely changed. It was something we wanted to conquer, something reducing mankind to the smallest thing, like breaking it. That’s how it was described in the old, romantic era. Now it’s all about the polar bears starving, the ice is retreating, and we need to save the ice. For sure I’m also climate conscious, it’s part of my work, it’s part of my duty to make what I can about that, but it’s a lot about tension and discord. How do you think your philosophy towards art, climate change and the world in general matched with La Prairie’s values to make you a good fit for the brand as an artist? There’s this idea of timelessness. I was not generally aware of La Prairie before, I knew them as a brand, but they are trying to create a product that is all about time. A lot of my pieces are about time. Different timelines, obviously, but I think that’s maybe the strongest link. [The piece is] all about eternal light, it’s all about reflection, it’s about perfection but also hidden spaces, and what is hidden in the shadows, and that was something that really interested me, so it was a bit obvious that I was the right candidate. They’re a Swiss brand, they’re working very scientifically, and I thought that was kind of interesting. Also it’s really an act of patronage, it’s not like I’m producing something for them and they put their logo on it. It’s much more about wanting to identify with the art and being very interested in what I’m doing, and supporting a big exhibition, which is important for me. I get support, and I bring a preview of the project, which is long-term, to Hong Kong. Art used to be very much about aesthetics, but nowadays the art world is more focused on ideas. To you, must art be beautiful? I don’t think so. But I will say if you look at my work, I’m always bringing a conceptual work, but I always bring in an aesthetic that might be appealing, also because a lot of the topics are more ugly or nasty – atomic test sites or maybe global warming – some topics are not beautiful, and to [beautify] that, first of all, it brings tension, because it’s not what you expect. I’m working on a project now on palm oil plantations, and it’s the worst thing to [beautify] the palm oil, but then you open the door to discussion … not just something is ugly, let’s show it ugly, or something is beautiful, let’s just show it beautiful. It’s all about complexity. Obviously icebergs are beautiful so it’s difficult to make them ugly. I think because the work deals with something that’s a little complex, you also have to invite people, like a door that you slightly open so that they look in, and once they look in, they can understand more. But if the work was repellent, you wouldn’t even interact with it, it won’t start a discussion. What did you know about La Prairie prior to this experience? I knew about the brand, that it was luxury cream. I knew they were from Switzerland, I had never tried it before. I saw them in Basel last year. They’ve provided me with some products, I’m grateful, I get to test everything. I will get some for home. I can’t go back to what I was using before! They also wanted me to test it because they knew a lot of people would ask! So, they’re good products, I will say. It was important for La Prairie to work with a Swiss artist. How would you define Swiss art? That’s something you can do in the field of design or architecture, but so many Swiss artists, there’s a very strong Swiss art scene, but I would say nothing can really connect them other than being part of a scene. In my case, it’s obvious that’s where I come from, where I grew up, it influenced what I’m interested in, because I grew up in an amazing landscape, I was really outside, and it’s definitely how I perceive the world, in this time, and influenced what I’m producing artistically today. So it’s something you can feel, but it’s definitely not a rule. In my case, because I’m interested in landscape and the how the landscape talks to us, there are a lot of landscapes everywhere, but there are a lot of different landscapes in Switzerland in a very small area; a very small country with a very diverse nature. So it’s not like America, you need to drive 1,000 kilometres to go from one place to another. In Switzerland, you can drive half an hour and you’ll see something completely different. It’s something that impacts me and my work. It’s quite common now for artists to work with brands. Do you think there’s a different way of working with a brand? Definitely. But in this case, definitely not. I’m a little bit old fashioned when it comes to it, I don’t want my image to be printed somewhere with a La Prairie logo. I’m very picky about that, I can be quite annoying, and they were very respectful of that, so they really acted as patron, and as of today, the world we live in, they are cutting cultural budget on every level, it’s now needed that brands that share some values are actually putting something back into the system. It’s like every museum in the world, nothing works without a brand anymore.